The purpose of this section is to present images and information about the two houses in Concord where Hawthorne and his family resided. Hawthorne and Sophia moved into the Old Manse, the house in Concord which they rented from Emerson, after their wedding on July 9, 1842 in Boston. On October 2, 1845, they moved back to Salem with their daughter, Una, where they lived with Hawthorne's mother and where Julian was born in 1846. In the summer of 1847, Hawthorne, his wife, two children, sisters, and mother, moved into 18 Chestnut St., but soon finding it too small, they moved to 14 Mall St. 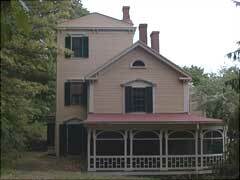 In May, 1850, Hawthorne, his wife, and children, moved to a cottage in Lenox, MA where Rose was born in 1851. In November of that year, Hawthorne and his family moved to the home of Horace Mann in West Newton, MA. In June of 1852, Hawthorne, Sophia, and their three children moved to the Wayside in Concord, the only house that Hawthorne ever owned. In July 1853, Hawthorne and his family left the Wayside for Liverpool, England, where Hawthorne worked as Consul, having been appointed by his college friend and now President, Franklin Pierce. After living and travelling in Europe for several years, Hawthorne and his family left England on June 16, 1860 and arrived in America on June 28 and returned to the Wayside. In their absence, Mary Mann, Sophia's sister, resided in the house; her husband Horace Mann, had died in August, 1859. After their return, Hawthorne remodeled the Wayside, adding the tower where he located his study. The tower was loosely modeled on the tower of the villa near Florence where he had lived while beginning The Marble Faun. Later Hawthorne wrote of his displeasure with the results of the remodelling of the Wayside, blaming the carpenter for ruining the appearance of the simple frame farmhouse. As part of his renovation project, completed in the spring of 1861, Hawthorne planted 450 Norway spruce and a woodbine. By September of 1862, Hawthorne's health was deteriorating, and he apparently sought refuge in his tower study. He had difficulty working but did edit selections from the English notebooks for the Atlantic Monthly as he had been doing since 1860. In June of 1863, the Atlantic Monthly articles he had written between 1860 and 1863 were published as Our Old Home. Then around December, 1863, or January, 1864, he began "The Dolliver Romance" which, like "Grimshawe" is set in the house next to the Charter Street Burying Point in Salem. Hawthorne's health continued to decline, and on May 10, 1864, Hawthorne left the Wayside on a trip through New Hampshire with Franklin Pierce. Sophia encouraged the trip, hoping it would be restorative for her husband, but on May 19, 1864, Hawthorne died in his room at the Pemigewasset House in Plymouth, New Hampshire.